I refer, of course, to the current official categorization scheme for planets -- and what isn't a planet. In our solar system the rocky -- or as some prefer to call them, terrestrial -- planets are Earth and its close neighbors: Mercury, Venus, and Mars. The gas-giant planets, of course, are Jupiter, Saturn, Uranus, and Neptune. The dwarf planets -- not really planets -- include Ceres (in the main asteroid belt) and a cast of, probably, hundreds in the Kuiper belt. It is into that last/new/contentious category that the International Astronomical Union reassigned -- many say, demoted -- Pluto in 2006. 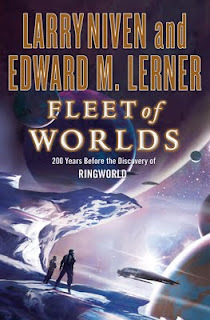 A recurring theme in reader emails and some reviews of Fleet of Worlds series books is, "Why don't the [your choice of crafty Known Space species] notice the Fleet as it barrels through space? Even today, astronomers see stars across great distances, and the worlds of the Fleet (with one exception, discussed below) are lit by artificial suns. The traditional answer (found in Ringworld, long before my entry into Known Space) is that no one thought to look between the stars. People (and Kzinti, and ...) hunted for Puppeteers on some as-yet undiscovered conventional world orbiting a sunlike star. What about before the Fleet set "sail" (not that, pre-Ringworld, anyone in Known Space suspected world-moving technology could exist)? Puppeteers had long ago relocated their planets to new orbits far from their sun -- which had undergone late-in-life expansion into a red giant. Any artificial suns close to planets would be very hard to spot from a great distance against the backdrop luminosity of a red giant! In short: the Fleet went undetected because everyone looked in the wrong places. But there's a second, more quantitative answer. I'm not sure it needs to be spelled (numbered?) out in the context of storytelling, but I think it's worth relating somewhere. So here goes.